Security Patch SUPEE-7405 - Possible Problems? After the experience with the last patches, I have to ask again: what are the possible problems when applying the patch and what do I need to consider? Lots of XSS issues were fixed again, so I expect to patch custom themes manually. Anything else? Are there backward incompatible changes? Cart Merge Patch (SUPEE-7978) : Carts with identical items now merge correctly. Previously, when a cart with one item was merged with another cart that contained the same item, Magento did not merge the cart totals correctly. The cart now includes only one item, and the total is correct. SOAP API Patch (SUPEE-7822) : The Magento SOAP API now works as expected. Previously after installing the SUPEE-7405 v1.0 patch, an API request would cause a 500 error, and Magento would log an exception. PHP 5.3 Compatibility (SUPEE-7882) : The patch was not compatible with PHP 5.3 for earlier versions of Magento that were still supporting this version. Merchants experiencing this issue were unable to view sales information in the Admin. Upload File Permissions : The patch restores less restrictive file permissions (0666 for files and 0777 for directories) as more strict permissions introduced by the original SUPEE-7405 patch caused many merchants not to be able to view uploaded product images, depending on hosting provider configuration. As stated, most of the changes are html escaping and data sanitizing regarding XSS issues. Form key validation has been added to the frontend cart delete action. Form key is added to the getDeleteUrl of Mage_Checkout_Block_Cart_Item_Renderer and validated in the deleteAction of Mage_Checkout_CartController. For those using Authorizenet (I don't) it seems like a few changes have been made, not sure how it impacts the system though. Changes include a new admin helper (Mage_Authorizenet_Helper_Admin) used to get the success order url. New Zend class: Zend_Xml_Security. Its purpose is to scan XML string for potential XXE and XEE attacks. However I did not find any reference to it in the other modified files. Files uploaded via admin panel (i.e. product image upload) are now not world readable by default (before: 777 / after: 640). I'll try to keep this list as up to date as possible. Before starting a new issue/question, please ensure you've applied all the previous patches as it seems like a lot of issues comes from missing patches. 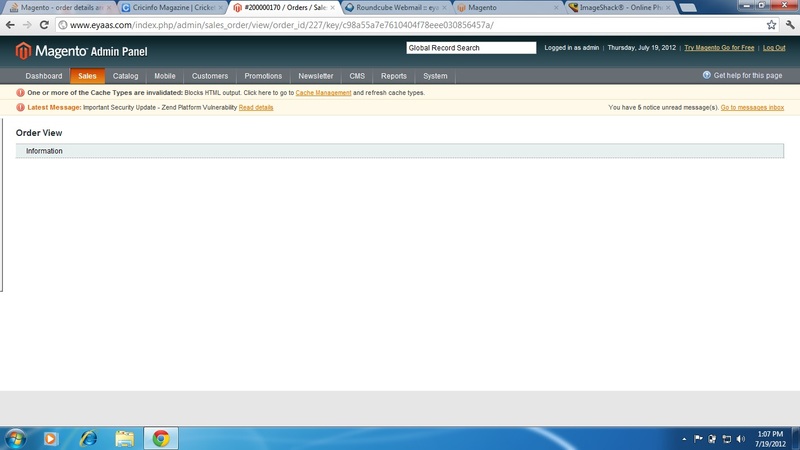 (fixed in v1.1 of the patch) Admin order view page is blank / broken => Related to the PHP < 5.4 incompatibility. => Fix can be found here: https://magento.stackexchange.com/a/98237/2380 / I've created a bug report: https://www.magentocommerce.com/bug-tracking/issue/index/id/1266 (credits: @Moonman67). Feel free to let me know if I miss something. One issue I have noticed is that if your site is using a version less than PHP 5.4 the patch is not compatible. Another error I ran into seemed to involve the cookies I had set. Once I cleared my cookies though, all pages have been loading fine. I'm not sure if anyone else has run into these issues, but hope it helps! This stopped my images displaying in the back end, since this file permission should actually be 644. Is there any reason this has been set to 640? template: admin templates mostly patched. If you updated from Magento EE 1.14.2.x to Magento EE 1.14.2.3 instead of applying the patch, and also applied the support patch SUPEE-5984 before, you have to reapply it again because it is not included in the release. Please be aware of dropped sessions issue recently discovered and fixed (?) by Colin Mollenhour. You need to apply SUPEE_7405_v1 then SUPEE_7405_v1.1 in order. Screenshot for admin order details page, If showing this type issue, Please follow below instruction its working for me !! Make a complete backup of the site files & database. After successful installation of the patch, clear the cache and make a test order to ensure everything works. I guess that's really all there is to it. The patches are designed to be installed quickly and without any hassle. 9 out of 10 times they will install perfectly fine and for the other times we have backups. As long as you are not messing with core files everything should be okay. After removing second (same) function declaration, the issue has been solved. I got following error after installing the SUPEE-7405 patch when try to login to admin. because I had this file overridden in local code pool which does not have sendHeadersAndExit method created by this patch. After adding this to the overridden file issue gone away. I perform a manual change on the file the file lib/Varien/File/Uploader.php to adjust the 0640/0750 permissions. The webserver user name is commonly www-data or apache. Not the answer you're looking for? Browse other questions tagged security patches magento-1 supee-7405 or ask your own question. Security Patch SUPEE-7405 or next version? Security Patch SUPEE-8788 - Possible Problems? Security Patch SUPEE-9767 - Possible issues? Security Patch SUPEE-10266 - Possible issues? Security Patch SUPEE-10415 - Possible Issues? Security Patch SUPEE-10570 - Possible issues? Security Patch SUPEE-10752 - Possible issues? Security Patch SUPEE-10888 - Possible issues?